Learn about the latest ideas and innovations with this classic material. With a history dating back to the second century, tile has long been used to add art to structures around the world. Today we continue to use it in our homes for visual as well as functional purposes. With technology and innovation, tile has drastically changed since its inception, and its popularity is growing along with it. 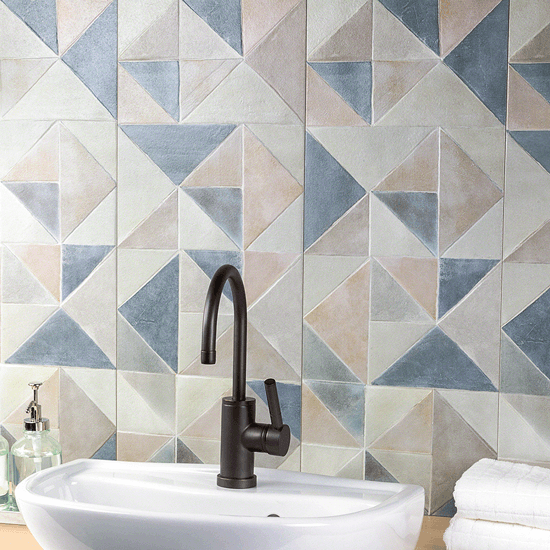 Check out these new tile trends that will liven up your home and be a smart investment. Tile comes in myriad colors to match your existing décor. This pattern from Granada Tile’s Echo Collection uses a popular Moorish-style design to update the space in a colorful way. 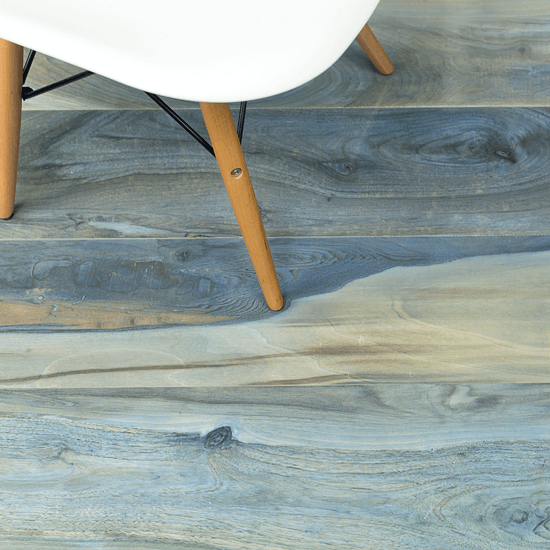 If you want carpet, marble, wood or cement in your home, you can get it in a porcelain tile look-alike that’s cheaper and will last longer. When you choose tile, you get your money’s worth with its guaranteed longevity, ensuring you a one-time buy that will last. “Tile has been used for thousands of years to create functional and beautiful spaces, and if installed and maintained properly, tile will last beyond the life of the structure it’s in,” says Fred Merullo, president of Tile Showcase. One of many imitations, this porcelain tile is made to look like wood, but it has the smooth surface of tile that is easy to maintain. This scale-patterned glass tile harks back to both Art Deco and midcentury designs. 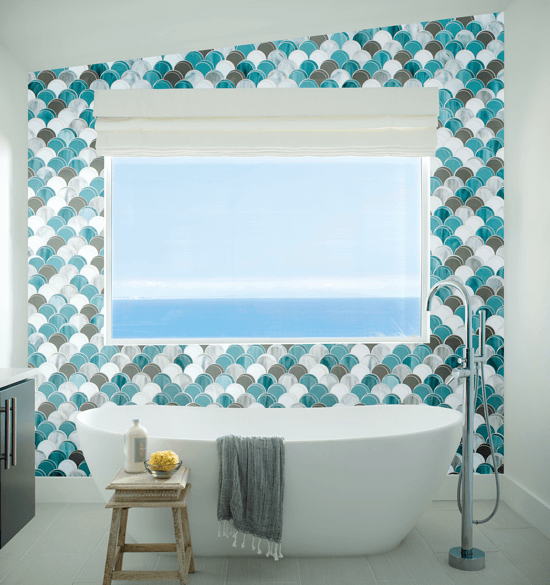 These shimmering glass tiles take on a glam look in this seaside bathroom. Nowadays you don’t have to sacrifice your personal style for these benefits. “Tile has really evolved with technology, and by that, I mean you can find a tile that looks like any material down to the last detail,” says Elisheva Neuman, director of marketing at TileBar. If you want carpet, marble, wood or cement in your home, you can get it in a porcelain tile look-alike that’s cheaper and will last longer. Tip: Remember to get a sample of your desired tile so you can compare it to the other design elements in the room before you make your final purchase. 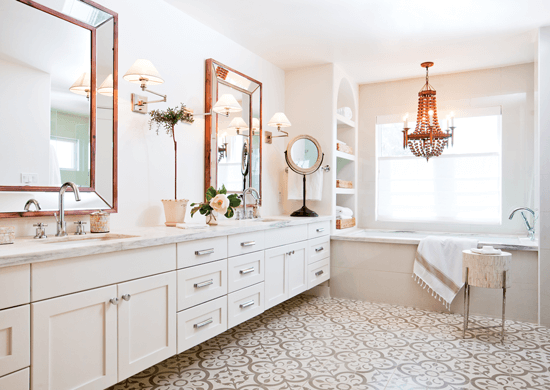 Along with several porcelain options, cement tile has become one of the leading choices tile trends. “One of the factors driving the renaissance in cement tile is people’s desire to live with organic, handmade materials,” says Melanie. Of course, subway tiles will always be popular for their traditional and wide-range appeal, but even this classic is undergoing a slight update. “One of the current trends in the industry is the large-scale rectangle, either in ceramic, porcelain or natural stone tiles,” says Fred. It can be laid horizontally, vertically or in a herringbone pattern. For a decorative focal point with impact, homeowners are turning to mosaic patterns as well. Mosaic tiles are among the most popular options for homeowners today. 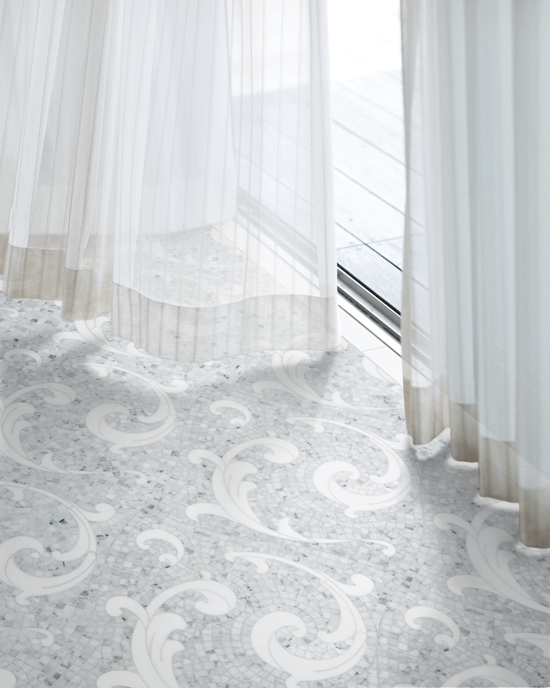 Intricate and stunning, this pattern from Tile Showcase can turn any surface– floor, wall or accent– into a gorgeous display. This neutral pattern from Granada Tile’s Echo Collection adds soft dimension and warmth to this bathroom. This ceramic tile gives this bathroom a weathered look and can withstand the abuse that bathroom materials often experience. “Our tile starts at about $30 a square foot. 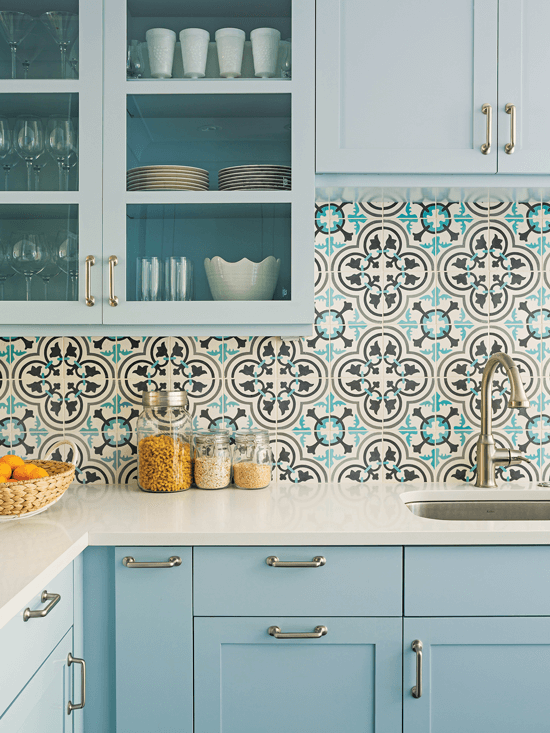 We see an average backsplash for a kitchen averaging between $1,500 and $2,500, depending on the size of the kitchen and the design,” says Stephanie. Though tile comes with affordable pricing, everything has an extravagant option. 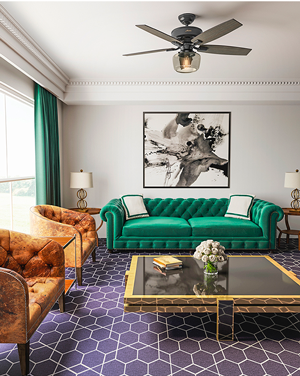 Some styles can go as high as $300 per square foot, depending on the material process and intricacy of the design. No matter what your budget is, make sure to include the price of an installer. Though there are many DIY tutorials on installing your own tile, know that the installation will determine the end result. 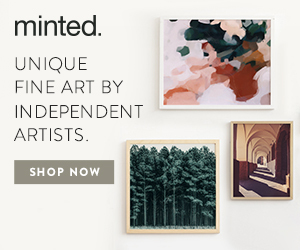 “Installing tile is an art,” says Fred. “The most beautiful tile can be chosen, but an excellent installation determines whether it looks fabulous or not.” On the other hand, “a poor installation can create cracking, staining and other problems down the road,” says Melanie. Need help choosing your remodel materials? 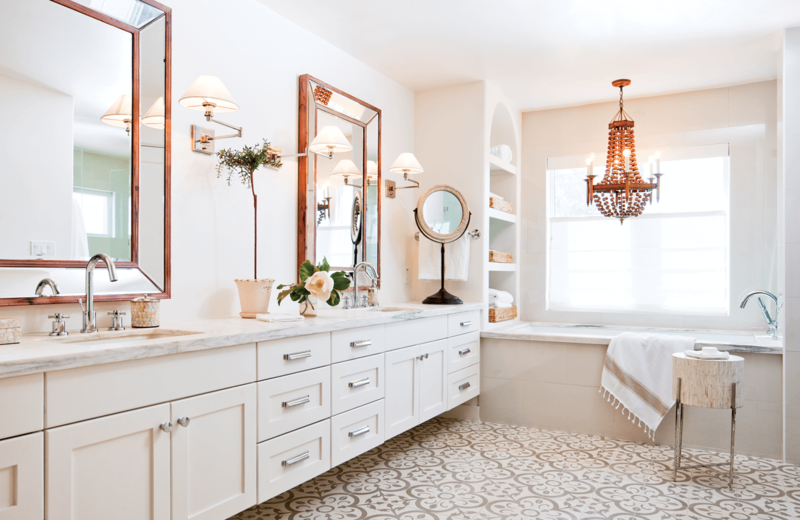 Check out this post on 5 tips for your next bathroom remodel. 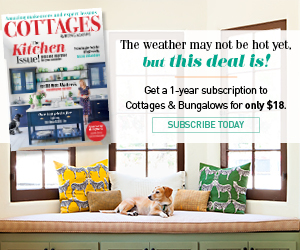 Of course, don’t forget to follow us on Instagram and Facebook to get your daily dose of cottage inspiration!